A 8-year-old male presented with exertional shortness of breath since the last 6 months. He denied any history of syncope, presyncope, palpitations or angina. The resting 12 lead ECG revealed complete left bundle branch block (LBBB), with PR interval 160 ms [Figure 1]a. The patient underwent an exercise stress test for evaluation of his symptoms. Intact 1:1 atrioventricular conduction was noted during stage 1 and stage 2 of the stress test, untill a sinus rate of 168 bpm [Figure 1]b. However, during stage 3, a sudden complete AV block was noted with a prolonged asystole [Figure 1]c. The patient complained of dizziness and became hypotensive. The test was immediately terminated and the patient put in a supine position. 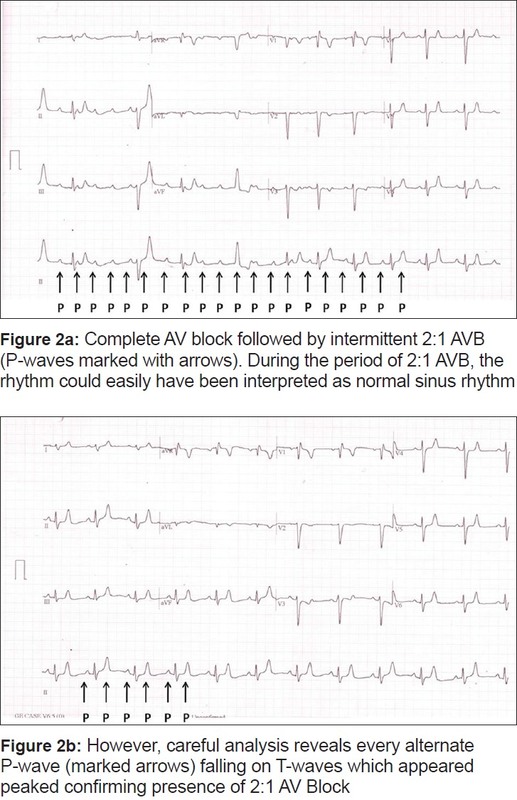 The episode of complete AV block was then followed by intermittent 2:1 AVB [Figure 2]a and b. 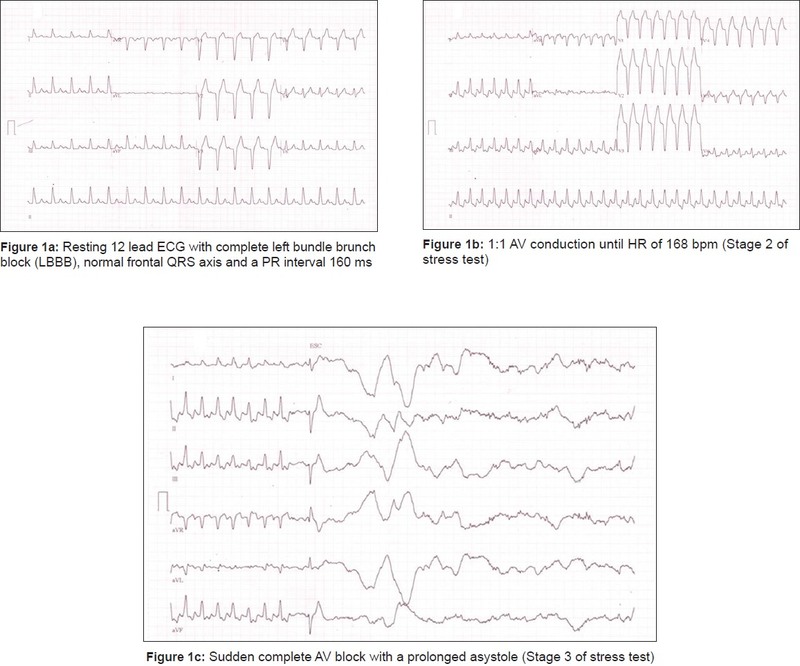 Transient 3:1 and 4:1 AV block [Figure 3]a and b were also noted before resumption of normal sinus rhythm occurred after nearly 20 min. Since the patient was hemodynamically stable and symptoms had resolved almost immediately on termination of the exercise test, temporary pacing was not initiated. The patient successfully underwent a dual chamber permanent pacemaker implantation 24 hours later. 1. 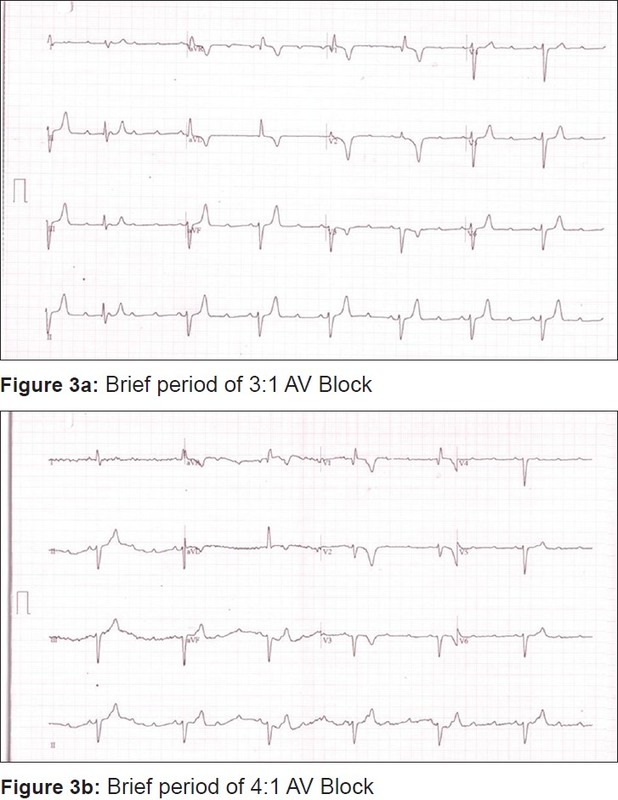 Byrne JM, Marais HJ, Cheek GA. Exercise-induced complete heart block in a patient with chronic bifascicular block. J Electrocardiol 1994;27:339-42. 2. Chokshi SK, Sarmiento J, Nazari J, Mattioni T, Zheutlin T, Kehoe R. Exercise-provoked distal atrioventricular block. Am J Cardiol 1990;66:114-6. 3. Woelfel AK, Simpson RJ Jr, Gettes LS, Foster JR. Exercise-induced distal atrioventricular block. J Am Coll Cardiol 1983;2:578-81.